Pictured, from left, are Rob Parker, WCDC president; Cameron Plew, Lake City Bank, WCDC board member; Stephanie Salyer, MutualBank, WCDC board member; Larry Plummer, superintendent of Parks, Warsaw Parks & Recreation; Warsaw Mayor Joe Thallemer; Shaun Gardner, maintenance director, Warsaw Parks & Recreation. 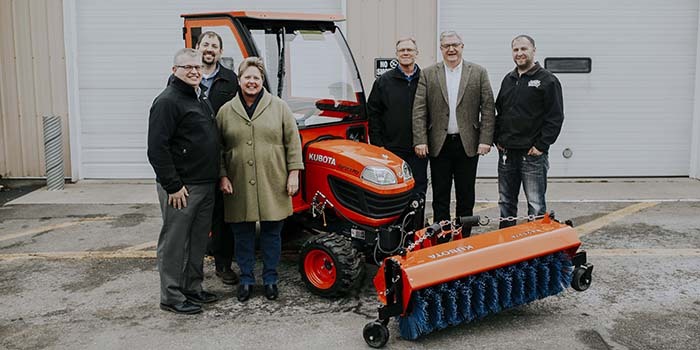 WARSAW — Warsaw Community Development Corporation, in partnership with the city of Warsaw, recently purchased a new tractor for downtown Warsaw that will be used to help with sidewalk snow removal, among other tasks. Warsaw Community Development strives to develop Warsaw’s Central Business District through investments in people, buildings, businesses, and land. For more information visit www.warsawcdc.org.